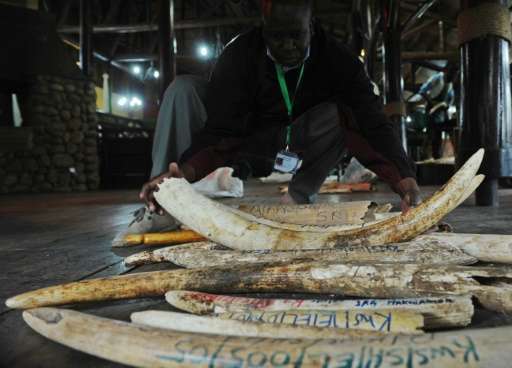 Kenya said Tuesday it will torch its vast stockpile of ivory at a star-studded summit to include Hollywood celebrities, presidents and business leaders against "poaching and illegal trade in ivory." " presidential spokesman Manoah Esipisu told reporters. Kenya said "several" heads of state were expected to attend, along with Hollywood actors Leonardo DiCaprio and Nicole Kidman, and business tycoons George Soros, Paul Allen, Howard Buffet and Michael Bloomberg. Others Kenya expects to attend include conservation icon and BBC legend David Attenborough, British musician Elton John, as well as former basketball star Yao Ming, who has led campaigns in his homeland of China to raise awareness of the damage elephant poaching causes. President Uhuru Kenyatta set fire in March 2015 to a giant pile of 15 tonnes of elephant ivory, which conservationists said then was the largest ever burned in Africa, and pledged to destroy the rest by the end of that year. The promised destruction of the remaining stockpile is now slated for April 29 and 30. Veteran conservationist Richard Leakey, chairman of the government's Kenya Wildlife Service (KWS), has championed the destruction of seized ivory. Leakey said the average weight of an elephant's pair of tusks was around 36 kilos, meaning the stockpile represents the death of around 4,000 animals. But other conservationists put a tusk's weight to be now far lower, meaning the stockpile could represent the deaths of even double that number. The ivory includes tusks seized from poachers and from animals who died naturally.